The poster child for the New School of Blogging is back in the press again today with the news that they had added another basic feature. 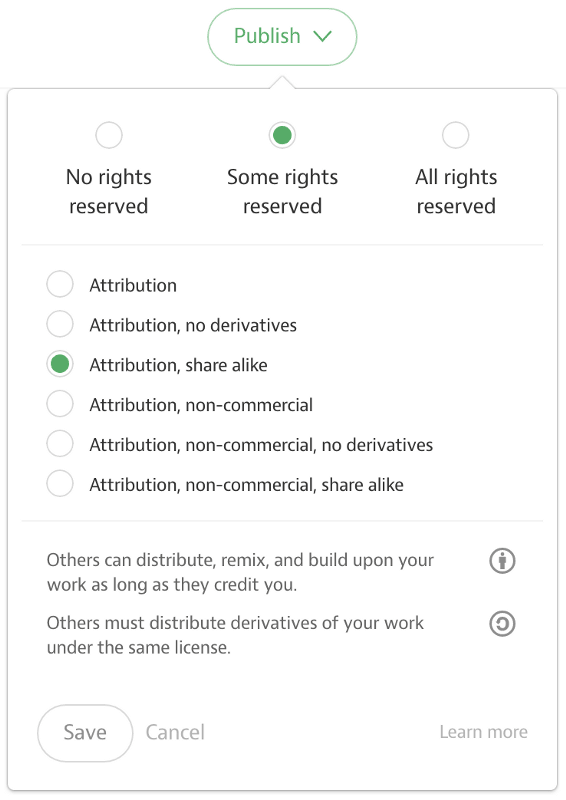 Medium announced on Wednesday that it has added explicit licensing for the Creative Commons. Today, in conjunction with Creative Commons, we’re happy to announce support for explicit post licensing on Medium. As Lawrence Lessig explains, the early web was characterised by a network of independent creators drawing inspiration from each others’ work. We are proud to play a part in this creative, collaborative tradition. While I like the concept of the creative commons license, I find myself puzzled by how this story merits coverage in The Verge, Boing Boing, and on other sites. It's nice that Medium is saving bloggers the effort of adding a short string of text to their bio or the signature of a post, but that is really all that was accomplished here. Today's news is another example of why I've come to wonder why Medium gets all this attention. They are just one blogging platform out of dozens, and yet they are getting about half of all of the media coverage. I can't see why Medium should get all the attention, which is why I think this mostly comes from good marketing. Medium has set itself up as the the leading light of blogging. I don't see why Medium deserves that label more than any other blogging platform, but they have pulled it off. They've made themselves the poster child of The New School of Blogging, and now that I understand what they are I plan to write about them less. As one of those people who does apply CC licenses manually, I’ll say going to the official website every time to fill that form of theirs is a lot more tedious than just ticking a checkbox. Also, a platform having built-in support allows for statistics and searching by license, both useful features. That said, I can’t believe a blogging platform whose marketing message is basically, “um, yeah, so, we let you write and publish blog posts” is making so much noise. It’s amazing. Do you suppose Medium is mostly used by Apple fans?